Often as we age, new information is often more difficult to recall than things of the past. Why this occurs isn’t surprising and there are definite strategies to help. But it does take practice. If I say autumn, what do you immediately think of? Did the cool, dry air of the last week remind you autumn is coming? Pumpkin flavored everything and Halloween decorations appear even before the calendar turns to September. Autumn and all we associate with it doesn’t just happen. It’s based upon our previous memories which are largely based on what and how we choose to remember. What we remember about any event, moment, season or bit of information is based on what we do with the input coming into our brains. Do we choose to feel the cooler air, see the leaves changing or wind picking up? We may dismiss this information because we are focused on something more important in our lives at that moment. But if we don’t pay enough attention to any bit of information, we’ll never remember it. Focused attention is the first component of remembering but the next step is just as important. Taking that information and doing something with it will help us recall it later. 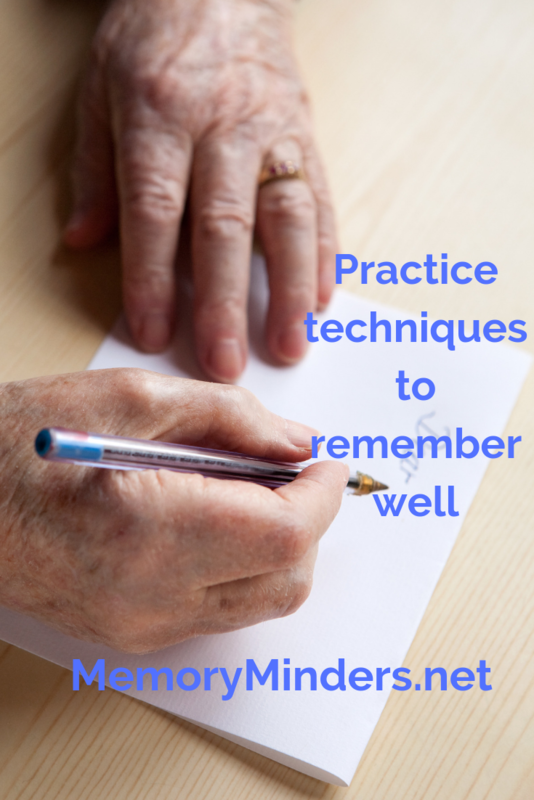 It’s those little techniques we all use to help us-writing it down, associating, repeating it, visualizing-these strategies really cement the moment in our memories. So when we see the leaves change, we immediately think autumn because it’s an association we’ve learned and repeated over and again since childhood. But how can we recall recent information and moments? The same way. Use memory techniques often and together to remember more. It’s not surprising we remember things from our past better than newer information-we’ve had more time to apply memory techniques to the information over and again. Recently I needed to remember something very common on my computer. But I hadn’t used it in a few months. I tried to recall the information using all kinds of techniques. Then I finally looked for the information where I knew I could find it and voila there it was! Being organized and knowing where and how to find information is also a memory technique. This can be just as important and easy as remembering it. We don’t have to remember EVERYTHING. We just need to know where or how to find it. The use of memory techniques to remember will be the tools we use to remember well as we age. Now we just need to practice and use these techniques daily and soon our memory for even the newer things of life will improve.